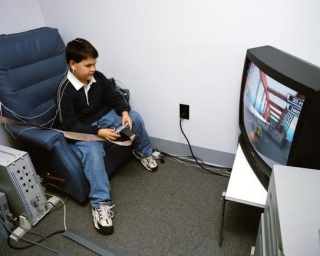 Teen uses prototype of Mindshift while playing videogame: image via physiologicalcomputing.comInventors, get your minds in gear to apply NASA's Mindshift technology to your next invention. NASA (the National Aeronautics and Space Administration) has partnered with Edison Nation to identify the best consumer inventions or product adaptations to use with its powerful mind control tool, Mindshift. For those of you who are not familiar with the technology, Mindshift is a physiological feedback system, developed by NASA's Langley Research Center, that monitors and provides feedback about a person's heart rate, muscle tension, and brainwave activity - all stress indicators. The feedback system allows you to control these stress indicators so that you can perform optimally. Today, NASA's Mindshift technology is being used alongside motion-sensing gaming technology like the Wii and Xbox. As the Mindshift controls are independent of the gaming program and control, Mindshift provides biofeedback to the user without interfering with the game, thus allowing the gamer to modify his stress levels so he or she can play better. Mindshift is also being explored for use in educational, psychological, and medial situations. Now, NASA is looking for new and adapted consumer products to use with Mindshift. What activities of home or work life would benefit from the 'mind control' that the Mindshift technology offers? What application can you create or modify to enhance this activity? This competition ends August 4, 2014, so get your mind under control right away and do your best work. You can submit as many ideas as you want. For details and resources, please visit Edison Nation.